A six-year-old boy gets stung by a bee and goes to his grandmother, who calls his hurt "saltypie". It brings back a memory from when she was younger and first moved into her home. A boy had thrown a rock at her which caused her to blood. Her two-year-old saw the red on her facing, thinking it was something else, tasted it and called it saltypie. 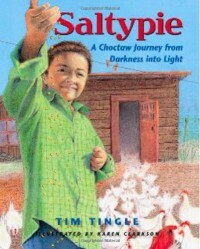 This is a great picture book that helps to teach about modern Indians and some of the bad treatment was/is experienced.